Fulham climbed into the top half of the Championship after hanging on to beat Blackburn, who had a late goal not given when the ball was over the line. 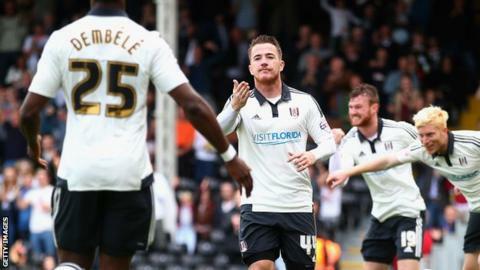 Ross McCormack stroked the hosts ahead before Moussa Dembele fired into the roof of the net from six yards. Jordan Rhodes pulled one back from the spot after James Husband pushed him. And Blackburn were only denied a late equaliser when Grant Hanley's effort was cleared by Jamie O'Hara, with replays showing the ball was in. Fulham's victory was their first in five games against Rovers and lifts them up to 11th in the Championship table, while winless Blackburn remain in the bottom three. They were made to work hard for the points by Gary Bowyer's side, who fought back valiantly after falling two goals behind and had more than than enough chances to earn a point. But ultimately they left themselves with too much to do after Fulham raced into a two-goal lead. McCormack fired the Cottagers ahead from 12 yards after being played in by Dembele, who then doubled their lead after Jason Steele had saved from Ryan Tunnicliffe and Tom Cairney. Home keeper Andy Lonergan saved brilliantly to keep out Ben Marshall's header and Rhodes hit the post at full stretch as Blackburn sought a way back into the game. They were finally rewarded when Rhodes sent Lonergan the wrong way from the spot and should have levelled when Hanley's effort was not given. Even then Bengaly-Fode Koita wasted another chance to equalise when he struck the post from close range as Fulham clung on for all three points. Match ends, Fulham 2, Blackburn Rovers 1. Second Half ends, Fulham 2, Blackburn Rovers 1. Corner, Fulham. Conceded by Danny Guthrie. Danny Guthrie (Blackburn Rovers) wins a free kick in the defensive half. Attempt saved. Moussa Dembele (Fulham) right footed shot from the left side of the box is saved in the bottom right corner. Assisted by Tim Ream. Foul by Tom Lawrence (Blackburn Rovers). Attempt saved. Bangaly-Fodé Koita (Blackburn Rovers) right footed shot from the right side of the box is saved in the top right corner. Attempt missed. Shane Duffy (Blackburn Rovers) left footed shot from outside the box misses to the left. Substitution, Blackburn Rovers. Tom Lawrence replaces Craig Conway. Substitution, Fulham. Dan Burn replaces James Husband. Offside, Blackburn Rovers. Craig Conway tries a through ball, but Ben Marshall is caught offside. Attempt missed. Craig Conway (Blackburn Rovers) right footed shot from the left side of the box misses to the right. Assisted by Hope Akpan with a headed pass. Attempt blocked. Shane Duffy (Blackburn Rovers) header from the centre of the box is blocked. Assisted by Craig Conway with a cross. Corner, Blackburn Rovers. Conceded by Richard Stearman. Substitution, Blackburn Rovers. Hope Akpan replaces Corry Evans. Attempt saved. Ross McCormack (Fulham) right footed shot from outside the box is saved in the top left corner. James Husband (Fulham) wins a free kick in the attacking half. Attempt saved. Moussa Dembele (Fulham) right footed shot from the left side of the box is saved in the bottom left corner. Assisted by James Husband. Attempt missed. Craig Conway (Blackburn Rovers) right footed shot from the centre of the box is too high. Delay in match Shane Duffy (Blackburn Rovers) because of an injury. Attempt blocked. Tom Cairney (Fulham) left footed shot from the centre of the box is blocked. Assisted by James Husband with a cross. Bangaly-Fodé Koita (Blackburn Rovers) is shown the yellow card for a bad foul.